I’m so grateful for my friend Dagmar and the work she does in the world. The amount of trauma, shame, and embarrassment around our sexuality is startling. And it’s not something you can so easily just compartmentalize. It shows up in how YOU show up to men and in relationships. Creating sexual freedom in your life is creating more freedom for you as a whole in your life. 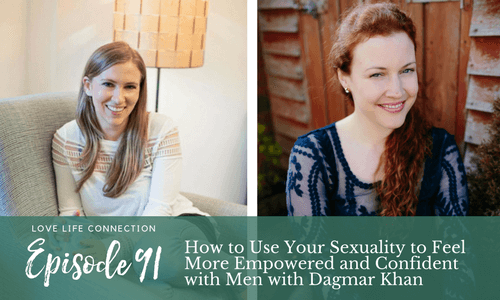 Dagmar Khan is a leading women’s health educator, sexuality expert and pelvic floor rehabilitation specialist who helps women live better in their own bodies. From professional athletes to those exhausted with chronic pain & stress, to everyday mamas trying to get their body back post-pregnancy, she creates first-class programming to outstanding performance and pain-free wellness. Dagmar regularly presents self- care conditioning in universities, fitness centers and medical facilities, runs successful online health advice and trains mind-body professionals to embrace self-care into their movement protocols. Dagmar is the creator of TOTAL PELVIC REVOLUTION; she is contributing fitness expert to Beat 102 103, and her work has been featured on Yoga Tune Up®, Independent, Regenerate, Dublin City FM, StressNoMore, Munster Express and Waterford News & Star. Ready to uplevel your life and relationships? If you’re ready for something big to change in your life, and you’re DONE with relationships never seeming to work, apply for your free Introductory Coaching Call here. If you get value from Love-Life Connection Podcast, please rate & review it in iTunes. It only takes a sec to impact our ranking + it’ll help other women find our community! Join me on Instagram to get your daily dose of inspiration of all things love, life, and cute puppies! Audible – Free audiobook download and a 30-day free trial.